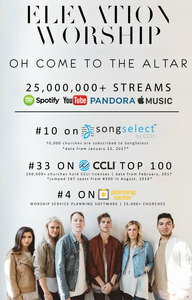 Elevation Worship is one of the most listened to Christian artists in the world. Their songs are sung every week in churches all over the US. In fact, Elevation currently has 5 songs in the TOP 100 on the latest CCLI chart which was released earlier in February. This brand NEW version and arrangement of "O Come To The Altar" was produced by Seth Mosley (for KING & COUNTRY, Francesca Battistelli) and is available for airplay now.